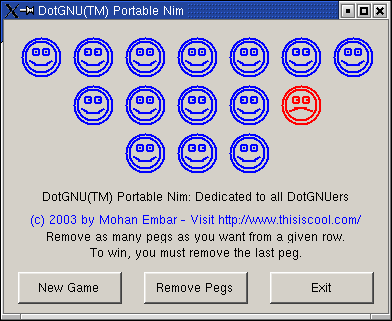 Mohan Embar wrote an implementation of the traditional "Nim" game to demonstrate how to write a Model-View-Controller application using DotGNU Portable.NET's System.Windows.Forms implementation. After unpacking the distribution, use "ilrun nim" to run the game. See the README file in the distribution for further instructions. Qt# Mahjongg is an example of writing a Qt# application for use with DotGNU Portable.NET. 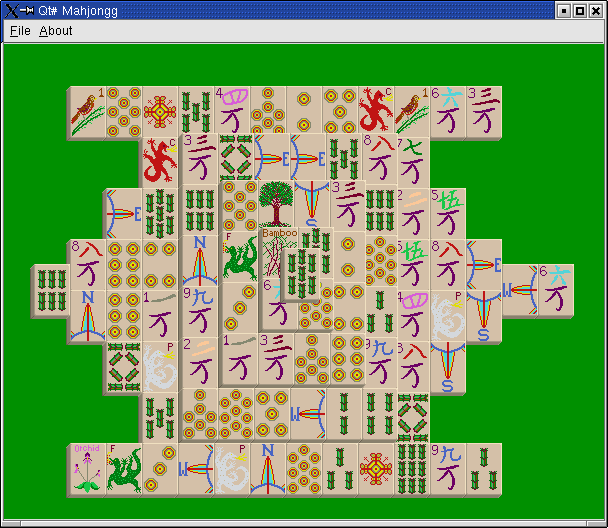 It implements a simple "match the tiles" game, similar to KMahjongg. You then run it by typing "ilrun mahjongg.exe" at the command-line. PNetMark is a benchmarking tool for Common Language Runtime (CLR) environments such as DotGNU Portable.NET. The original version was loosely based on the techniques used by the CaffeineMark to benchmark Java Virtual Machines. Since then, two other standard floating-point benchmarks have been included: SciMark and Linpack. See the README file in the distribution for instructions on compiling and running the benchmarks. The Pnetcurses package also includes a small game called "Curse of Frogger" that demonstrates how to use the library. The Xsharp and System.Drawing.Win32 libraries within pnetlib also use PInvoke extensively, so you can look at those for further guidelines. You will probably also want to read the PInvoke Conventions for Unix guide when writing PInvoke applications.